A bee can only fly for so long between flowers before it runs out of energy. Bumblebees have such fast metabolisms that they're never more than 40 mins from starvation, which must give navigating to your next flower a sense of urgency. Now bees like humans shouldn't live on a diet of sugar, however we do have the power to revive exhausted bees with a one off tiny drop of sugar solution. So we invented a sugar solution carrier for your wallet to revive bees! Our cards get cheaper the more you buy... so one is £4, and two are £3.50 each. We love a good idea! Each Bee Saviour Card is refillable and handmade in our workshop. Our ambition is that 100% of Bee Saviour Cards we produce are made out of old cards destined for landfill and so you’re also reducing plastic waste. The finished card is made without using any new plastic and because it's the size of a credit card you won't even notice you're carrying it! There's never been a time the world has needed Bee Saviour Citizens more! We know that the act of reviving one bee won't reverse bee population decline. What we do know is the moment has come for a global community of people who feel connected to their local bees and take action to reduce bee colony decline. Reviving a bee creates moments to inspire a generation of Bee Saviour Citizens! With your help we can take #savethebees to the next level! You can help us set up Bee Saviour Behaviour as an organisation shaped by you our members, creating innovative ways to take action to reduce bee population decline. 55% of the worlds population lives in cities and it's increasing. Our campaigns and innovative ways to take action with focus on urban dwellers and will always seek to reuse existing materials and reduce plastic waste. This is a credit card sized sugar solution carrier for your wallet or purse that can be returned and refilled. 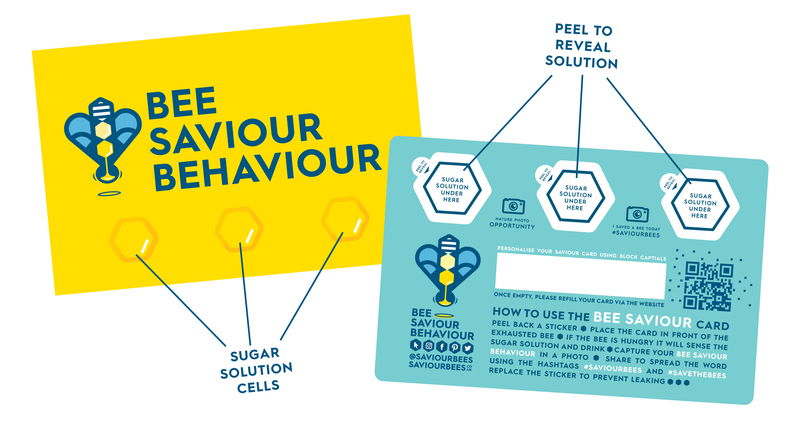 Your card comes with a Worker Bee certificate and a history-tag to help record and share all your bee saviour behaviour. Screen printed heavy cotton bag with a small credit card sized pocket on the inside for a Bee Saviour Card. We love to celebrate bee saviour behaviour. When you become a co-op member you'll receive a Bee Saviour Citizen certificate and plenty of opportunities to gain further rewards. We want to invite new connections with the urban nature around us. Our Bee Saviour Card allows anyone to save a bee when you're out and about... and so supporting our campaign will help this Card reach new and bigger audiences. We want to invite a community of people who cares about bee population decline to help us build the next chapter for Bee Saviour Behaviour. Your investment will allow us to set up as a co-op and retool to make the Bee Saviour Card better... and in exchange for your support you can become a co-op member. We believe in community. We want to build a community of Bee Saviour Citizens who feel inspired to do the social media liking and sharing, get active in their neighbourhoods and share ownership of our organisation. Supporting our campaign helps us create new campaigns, products and citizen science projects. We have seen the impact that community connections can create here at Bee Saviour Behaviour and so part of what a successful crowdfunding campaign would allow us to do is explore what a local Bee Saviour Community could look like. Our plan is to install at least one hive in the city to inspire and demystify the world of bees for people. Communities - Gathering people together for action and connection is central to what we are passionate about; this is why we're setting up as a co-operative. Our fundamental ambition is to grow a community of Bee Saviour Citizens drawn to us by our innovative campaigns, actions and things to do. We'd like to do this by being a pioneering co-operative creating new ways for you to shape and contribute to what we get up to as a group of people passionate about bees. Cities - What would Bee Saviour Cities look like and how could we play a part in making them into a movement excites us. Amsterdam has managed to see bee population numbers increase by 45% since 2000. There's lots to learn from other cities around the world to spread the power of collective action. Policies - As the scientific evidence mounts up about the impact of pesticides on bee populations and with uncertain times ahead, it's important that pressure if constantly applied to governments for bee friendly policy making. The super ambassador reward takes your commitment to building a Bee Saviour Community to the next level. You'll receive a Bee Saviour Card vending machine and stock of 100 Bee Saviour Cards.  We'll also thank you for your support on the 'Our Story' page of our website and visit your venue to run a 2 hour workshop for 20 participants. This reward also comes with 10 x standard enamel pin badges, 10 x gold enamel badges and 20 x tote bags.